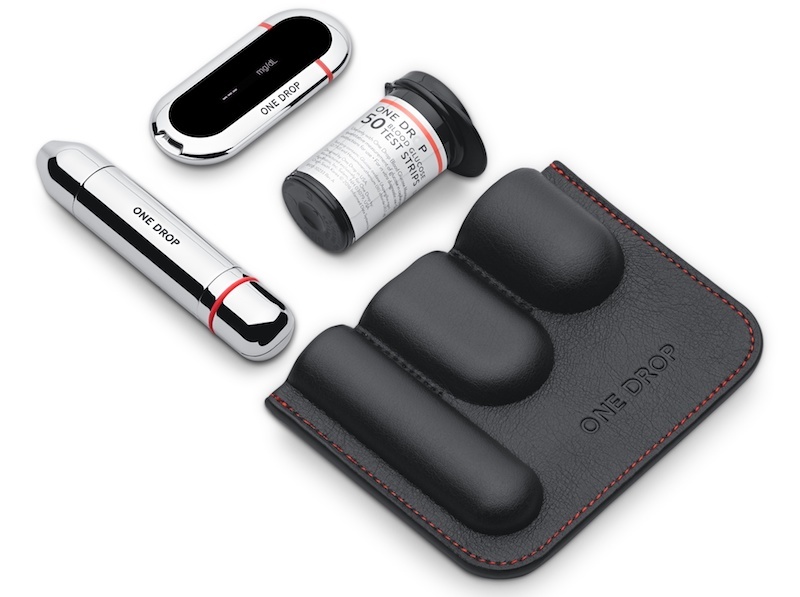 Health startup One Drop recently launched its iOS-compatible One Drop Chrome Blood Glucose Monitoring Kit on Apple.com for $99.95. Approved by the FDA and CE in Europe, the kit includes a Bluetooth-enabled blood glucose meter, a chrome lancing device, test strips, and a vegan leather carry case. The blood glucose meter can read results "in just five seconds," transmitting the data to the One Drop iOS app [Direct Link] that users can download on iPhone, iPad, iPod touch, and Apple Watch. One Drop's lancing device has custom depth settings to provide the right amount of pressure on a user-by-user basis in order to draw "a perfect drop every time." To keep up on compatible test strips, users can subscribe to One Drop Premium for a monthly $39.95 fee. With Apple's energetic and consistent focus on health, One Drop provides a premium product that not only meshes well with Apple's design sensibility, but aligns well with their desire to empower users to take control of their health. Its new Chrome hardware connects to One Drop’s iOS, watchOS, and Android apps, and have full HealthKit and CareKit integration, allowing you to sync data from other health apps (e.g., CGMs, bluetooth meters, food & activity trackers) and share your data with your Care Team. One Drop was one of four apps to launch with Apple's CareKit platform in 2016, including fertility tracker Glow Nurture, maternity app Glow Baby, and depression medication tracker Start. CareKit allows app developers to create integrated software that helps patients and doctors to better track and manage medical conditions. On Apple.com, the One Drop Monitoring Kit is available for both store pickup and home shipping, with delivery dates listed as early as tomorrow, January 13. For more information on One Drop, check out the company's website here. as a type 1 diabetic, i'm glad more and more technology is getting into diabetes. I need to look more into this product. How many vegans did they have to kill to make all of those cases? Unbelievable! Pretty pricey though. iHealth's Smart Glucometer is only $30 up front, offers the same functionality, and 100 strips only cost $25. For this, you're just paying for fancy chrome and unbelievably pretentious-sounding "Vegan Leather". Personally I would rather they open up NFC to other developers so they can support CGM (Continuous Glucose Monitor) devices such as the Freestyle Libre, like Android already does. I could not agree more. I've been fortunate enough to use the Freestyle Libre for about 6 months now, and despite 20 years of diabetes type 1, ive never had better control. Its by far the best thing to happen to me and my diabetes, too bad Apple wont open up their NFC to allow me to control my blood glucose with my iphone. Currently i have to use a third party device, or an android phone - neither of which i really like...! Please apple please!!! What about Lancets? How are those handled with this system? I own't say anything nice about Johnson and Johnson or Lifescan. I can only say that with Obamacare, here in California, I pay $5 for 400 test strips. Lasts me months. All those Governors of the red states really screwed their people by rejecting it. While I appreciate you getting $600 (retail) of test strips for $5, someone is paying that other $595 (again, retail). I'm sure that if "Obamacare" is repealed, the good people of California will happily make a better version, like that red state governor, Mitt Romney, did in Massachusetts, and not inflict it on the rest of the 49 States. Oh yeah, those "Red State Governors" that "screwed their people" were re-elected, or another "Red State Governor" took their place, or even more shocking, in 2010 there were 23 "Red State" governors, and now there are 34 of them. But then again, that's the beauty of a Federal system. If you like your plan in your state, you can keep that plan in your state. *whether it is those that pay a check or a subsidy, which, in that case, is the taxpayers. The readings ranged wildly from the get go. I contacted them and after a dozen conversations of them trying to justify why their reader accuracy was so poor they agreed to send a replacement. I waited for several weeks and the replacement never came. Cancelling the account itself was needlessly cumbersome. In one of my conversations with them they suggested I should do two readings every time (even though that did not help accuracy at all). I told them they should rename themselves TwoDrops instead of OneDrop. The product itself looks good online but it's no more than chrome coated cheap plastic.